The only daughter of Soviet dictator Joseph Stalin has died in Wisconsin, aged 85. Svetlana Peters, who famously denounced communism and moved to the United States in the late 1960s, died from colon cancer. Her defection in 1967 – partly motivated by the poor treatment of her late husband, Brijesh Singh, by Soviet authorities – caused an international furore. Within months, she published her a memoir about life in Russia, entitled Twenty Letters to a Friend, that became a best-seller. But Peters, who was known internationally by her previous name, Svetlana Alliluyeva, said her identity involved more than just switching from one side to the other in the Cold War. She said she had come to doubt the communism she was taught growing up and believed there weren’t capitalists or communists, just good and bad human beings. In the book, she recalled her father, who died in 1953 after ruling the nation for 29 years, as a distant and paranoid man. Soviet Premier Alexei Kosygin denounced her as a ‘morally unstable’ and ‘sick person’. ‘I switched camps from the Marxists to the capitalists,’ she recalled in a 2007 interview. But she said her identity was far more complex than that and never completely understood. ‘Or they say, “No, she came here. She is an American citizen.” That means I’m with a bomb against the others. The defection came at a high personal cost. She left two children behind in Russia — Josef and Yekaterina — from previous marriages. Both were upset by her departure, and she was never close to either again. Peters was Stalin’s only daughter. She had two brothers, Vasili and Jacob. 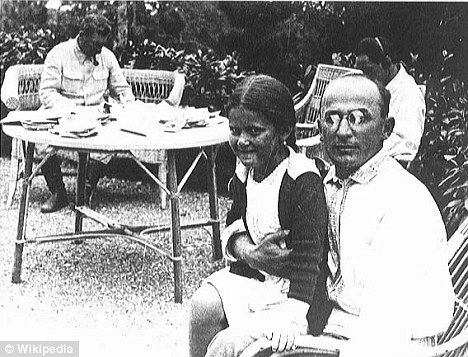 When Lana was six years old, her mother, Stalin’s second wife, Nadezhda, shot herself after a row over his philandering. Thereafter, Lana was raised by a beloved nanny. At 17, she fell in love for the first time, with a film-maker and writer 22 years her senior named Aleksei Kapler. But Stalin did not approve of Kapler, whom he dismissed as a ‘Bohemian artist’ and a Jew, and banished him to Siberia for ten years. Incensed that her boyfriend had influenced her to apply for a university fine arts course, he also insisted she study history and become ‘an educated Marxist’. In an interview with the Daily Mail last year, she said of her father: ‘He broke my life. I want to explain to you, he broke my life twice. Peters graduated from Moscow University in 1949, worked as a teacher and translator and travelled in Moscow’s literary circles before leaving the Soviet Union. She was married four times – the last time to William Wesley Peters, an apprentice to the great architect Frank Lloyd Wright. She took the name Lana Peters. The couple had a daughter, Olga, before divorcing in 1973. Peters wrote three more books, including Only One Year, an autobiography published in 1969. The book made more than $3 million. Her father’s legacy appeared to haunt her throughout her life. She denounced his policies, which included sending millions into labor camps. ‘Over me my father’s shadow hovers, no matter what I do or say,’ she lamented in a 1983 interview with the Chicago Tribune. This entry was posted in Communism. Bookmark the permalink.